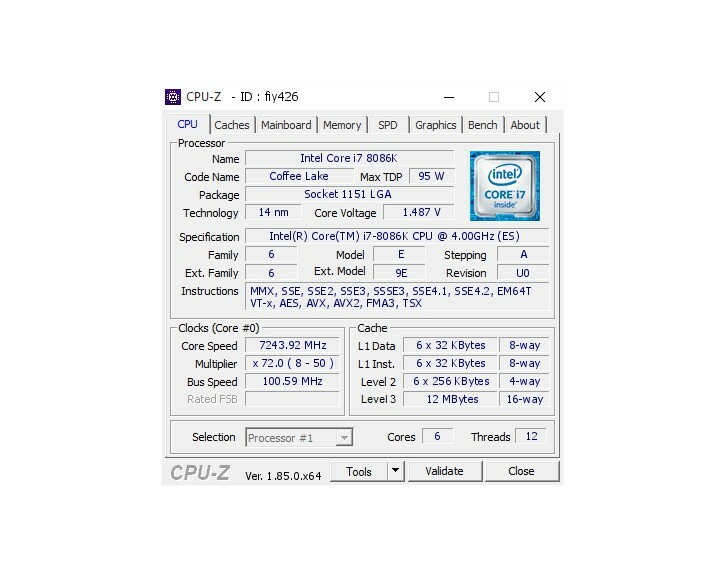 A few days ago, Intel launched their Core i7-8086K to mark the 40th Anniversary of their 8086 chip that started the x86 revolution and meanwhile there are already a couple of impressive overclocking results on HWBOT. At the moment in the first place we find the german overclocker "Der8auer" who was able to achieve a monstrously high 7'243 MHz. Although the frequency might look pretty high, it didn't break any record yet. The benchmark has been conducted on a Z370 ROG Maximus Apex which is the flagship model for ASUS. In addition Der8auer has used G.Skill DDR4 memory and an unspecific graphics card. The processor used by Der8aer at the G.Skill booth was delidded and cooled under LN2 at -185C temperature. The voltage has been set to 1.85V and the CPU has reached 7'243 MHz across all cores. So far there are only a few results on HWBOT and we expect to see competition pick up rather sooner than later. The Intel Core i7-8086K will be available in few days with a launch price of $429 USD.